Peterhansel powers through the sands during his dominant third stage display. 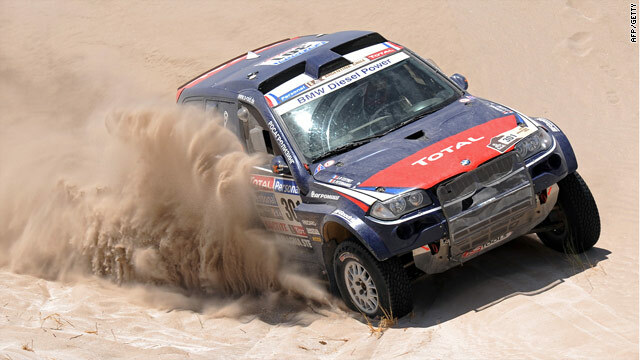 (CNN) -- Dakar Rally legend Stephane Peterhansel took control of this year's edition with a commanding victory in the third stage in Argentina. Peterhansel, a six-time winner of the motorcycle section and going for his fourth win in the cars, was in control from the very beginning of the leg from La Rioja to Fiambala. The BMW team leader finished finished five minutes 44 seconds clear of former world rally champion Carlos Sainz in his Volkswagen. It gives him an advantage four minutes 33 seconds over the second-placed Spaniard ahead of Tuesday's fourth stage. Overnight leader Qatar's Nasser Al-Attiyah is in third after ending the stage after losing 10 minutes on the stage to Peterhansel. But defending champion Giniel De Villiers' hopes of a back to back win look to have ended after engine trouble while Nani Roma, winner of the first special stage, lost time after coming off for the second straight day and lost several hours. Cyril Despres of France, riding a KTM took the overall lead in the motorbike category as he took the stage ahead of Portuguese rider Helder Rodrigues on a Yamaha with Paulo Goncalves on a BMW in third. France's David Casteu was fourth on a Sherco and moved into second overall, a place ahead of Rodrigues.